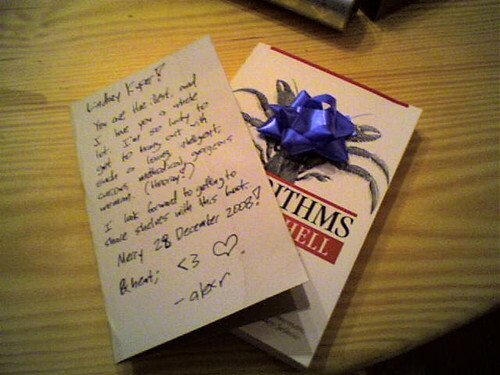 Alex oniugnip's gift-giving style: we go to the bookstore, I pick out a book1, he buys it for me, we go home, and then he actually puts a bow on it and hands it to me with an adorable note. I look forward to getting to share shelves with this book. It's embarrassing how little I know about algorithms. I took a class, you know, the way folks do. But that was in 2003. And I don't remember much of what I learned, and what I do remember I probably wouldn't be able to explain to someone at a party. But the introduction of Algorithms in a Nutshell is all, "If you need to know why algorithms work, go get out your CLRS ; otherwise, read this." Perfect! That's what I need. he is lucky, in fact. That note in the picture looks weirdly familiar. I can't figure out why. Have you posted pictures of similar notes before? Don't think so, but you've probably seen Alex's handwriting before, and that's the kind of pen he always uses, too.